Since 1969, the Mexico City Metro has grown a lot. No so long ago, it came in the top 10 busiest metros of the world. The 226.5 km long network that runs on 12 lines, serving 195 stations in total, is the second longest metro system in North America. Officially know as the Sistema de Transporte Colectivo, the metro is an important means of public transportation for the people of Mexico City with an annual ridership of 1.685 billion in the year 2013. 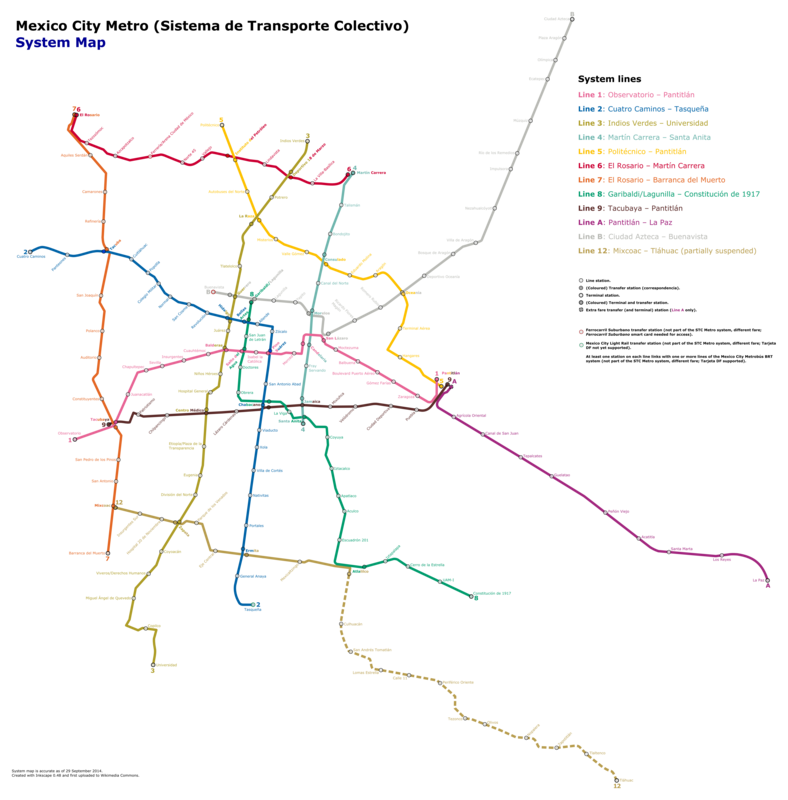 Map of Mexico City Metro showing various lines and stations. On Labor Day, the metro operates from 05:00 am in the morning, until midnight. During the weekdays and Saturdays, the timings are slightly different. The metro begins operations an hour later, at 06:00 am in the morning, and runs until midnight. On Sundays and other holidays, the metros too has a later start than usual at 07:00 am and running till midnight. A STC metro ticket costs MXN $5 (5 pesos), and provides unlimited distance travel and transfer at any given time. The ticket is available at a discounted rate of 3 pesos, for unemployed people, students and women passengers. The riders can purchase these tickets from booths. The metro also offers rechargeable cards that can be purchased by paying an initial cost of 10 pesos. These cards can be recharged to a maximum of 620 pesos for 310 trips on the metro. These cards can be recharged at ticket counters at all stations. Some of the stations also have machines, where the cards can be recharged. The metro system also uses a Tarjeta DF card, which is a prepaid card and stores credit. In addition to metro, this card can also be used to pay fares on light rail, Metrobus, and trolleybus. Children under the age of five years, senior citizens and people with physical disabilities can ride the metro for free. The metro offers park and ride facilities at most of the stations. In addition, there are various parking lots on the streets that offer parking spots. The metro is considered to be one of the cheapest in the world, due to its heavily subsidized rates. Some of the stations are beautifully decorated and display Columbian artifacts and architecture. The metro can get quite congested during peak hours, so travelling during peak hours is best avoided, if not necessary. The metro is considered to be one of the cheapest in the world, due to its heavily subsidized rates. Some of the stations are beautifully decorated and display Columbian artifacts and architecture. The metro can get quite congested during peak hours, so travelling during peak hours is best avoided, if not necessary. The entire metro network is extremely accessible, with special facilities for the disabled in most of the stations. You can travel the metro along with your bicycle however, certain rules must be followed. There is a Lost and Found department as well where one can go to claim any lost good. Currently Mexico City Metro has 12 lines serving 195 stations and each line offers one service only. The metro lines are recognized by number and color. ● Line 1 –Line 1 started operation in 1969 and the metro offer service from Observatorio towards Pantitlan. The length of the line is 16.6km serving 20 stations. ● Line 2 – Line 2 started operation in 1970 and the metro offer service from Cuatro Caminos towards Tasquena. The length of the line is 20.7km serving 24 stations. ● Line 3 – Line 3 started operation in 1970 and the metro offer service from Indios Verdes towards Universidad. The length of the line is 21.2km serving 21 stations. ● Line 4– Line 4 started operation in 1981 and the metro offer service from Martin Carrera towards Santa Anita. The length of the line is 9.3km serving 10 stations. ● Line 5 – Line 5 started operation in 1981 and the metro offer service from Politecnico towards Pantitlan. The length of the line is 14.4km serving 13 stations. ● Line 6 – Line 6 started operation in 1983 and the metro offer service from EI Rosario towards Martin Carrera. The length of the line is 11.4km serving 11 stations. ● Line 7 – line 7 started operation in 1984 and the metro offer service from EI Rosario towards Barranca Del Muerto. The length of the line is 17km serving 14 stations. ● Line 8 – Line 8 started operation in 1994 and the metro offer service from Garibaldi towards Constitucion de 1917. The length of the line is 17.6km serving 19 stations. ● Line 9 – Line 9 started operation in 1987 and the metro offer service from Tacubaya towards Pantitlan. The length of the line is 13.3km serving 12 stations. ● Line A – Line A started operation in 1991 and the metro offer service from Pantitlan towards LaParz. The length of the line is 14.8km serving 10 stations. ● Line B – Line B started operation in 1999 and the metro offer service from Ciudad Azteca towards Buenavista. The length of the line is 20.2km serving 21 stations.